Just when you think it’s the end of your story…grace shows up. Sometimes it arrives as a moment of joy in the middle of despair. Sometimes you find it next to a trusted friend along an old, well-trodden path. And sometimes, grace has fuzzy ears, a bristled mane, and hope for a new start. Join Rachel Anne Ridge, author of the thoughtful and poignant memoir Flash, in a journey back to the pasture. 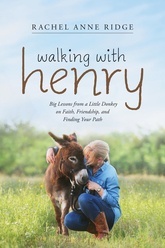 When Rachel adopts a second rescue donkey—a miniature named Henry—as a little brother for Flash, she finds that walking with these peaceful and underappreciated animals has surprising lessons to teach us about prayer, moving forward from past regrets, renewing our faith, and connecting to God in fresh ways. Rachel Anne Ridge is the author of several books. A professional artist and designer, Rachel has also served as a writer for Going Beyond Ministries with Priscilla Shirer.